WASHINGTON — Secretary of Homeland Security Kirstjen Nielsen, who has become the face of President Trump’s hardline immigration push, resigned on Sunday. Following are reactions from members of the Congressional Asian Pacific American Caucus. Sen. Mazie Hirono (D-Hawaii): “I have repeatedly called for Kirstjen Nielsen’s resignation for her lies in service of DonaldTrump’s abhorrent immigration policies, and I welcome her decision today. History will not judge her or the president kindly. 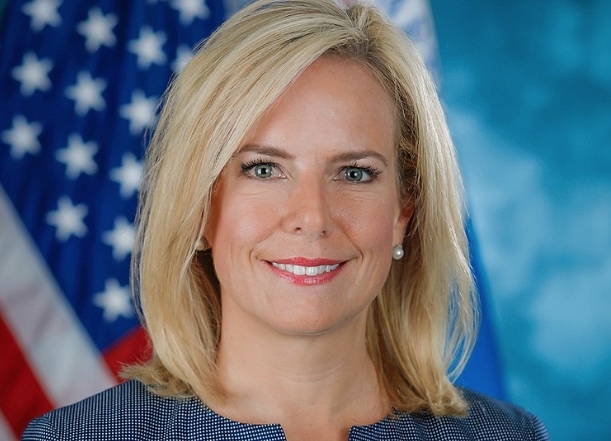 “Sadly, we can expect Donald Trump to nominate a permanent replacement who will also do his bidding as DHS secretary. We must continue to speak out and remain organized and vigilant. Sen. Kamala Harris (D-Calif.): “Kirstjen Nielsen’s resignation was long overdue. Under her tenure, children were ripped from their parents’ arms and locked into cages, forced to endure inhumane conditions and to suffer trauma that will endure for the rest of their lives. She repeatedly denied under oath that the administration implemented a family separation policy despite overwhelming evidence to the contrary. Her leadership failed the department’s mission and hurt morale among her employees. Rep. Judy Chu (D-Pasadena): “The separation of families at the border was a moral disaster that did not reduce asylum seekers. That Trump wants to return to this policy shows that he’s more interested in broadcasting bigotry than in actually addressing the root causes of why families are fleeing to the U.S.
Rep. Pramila Jayapal (D-Wash.): “Secretary Nielsen will go down in history as presiding over an exceptionally cruel regime that separated children from their parents and violated human rights. I welcome her resignation. But, that does not end our quest for accountability for the abuses that occurred on her watch and at the direction of this president.